Jersey City, NJ- Filipino youth organization, Anakbayan New Jersey (AB-NJ), and community activists gathered at the Journal Square Memorial Fountain on Friday night as part of Anakbayan-USA’s National Day of Action to demand justice for small- scale miner and Sikadan-Anakbayan member, Freddie “Fermin” Ligiw, and his family. 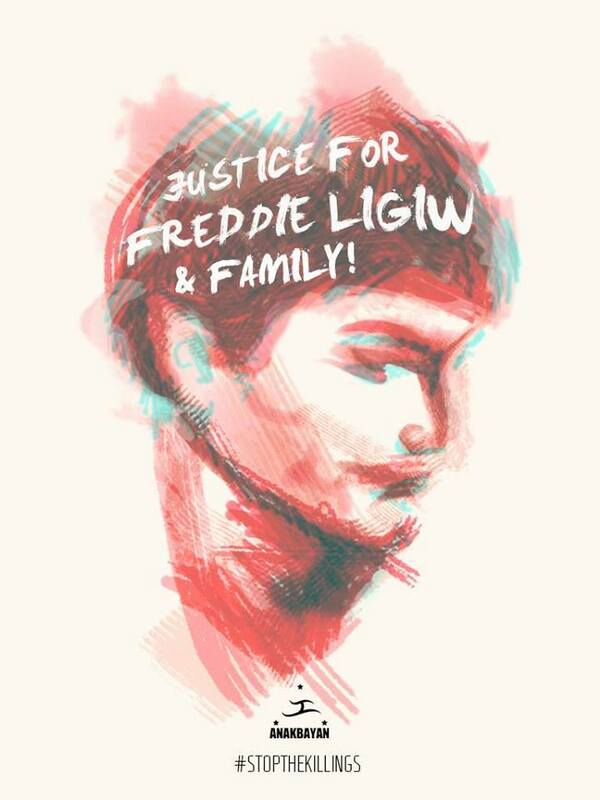 The remains of Ligiw, his father, Licuben, and brother, Eddie, were found in a shallow grave close to their residence in Licuan-Baay, Abra, Philippines on March 7. The three were prominent community leaders who opposed large-scale mining operations in Abra, and were active members of grassroots organizations, Kakailan Salakniban Tay Amin a Nagtaudan (KASTAN), a provincial chapter of Cordillera Peoples’ Alliance, and Anakbayan. A fact-finding mission by the Cordillera Human Rights Alliance on March 9 revealed that the 41st Infantry Battalion (IB) of the Armed Forces of the Philippines (AFP) was conducting combat operations against the New Peoples’ Army several days before the Ligiws went missing. Perpetrators of these atrocious operations persist with impunity as the Aquino administration continues to implement Oplan Bayanihan (Operation Plan Shoulder-to-Shoulder), a counterinsurgency program that has historically targeted activists, peoples’ lawyers, journalists and other grassroots leaders in an effort to quell the revolutionary movement in the Philippine countryside. Aquino has also consistently promoted and justified the planned expansion of US military access to the Philippines. Amidst the US Military Pivot to the Asia-Pacific, the number of human rights violations against activists and community leaders in the Philippines is steadily rising. At the end of 2013, Philippine human rights alliance, Karapatan, documented 169 cases of extrajudicial killings since President Benigno “NoyNoy” Aquino took office in 2010. That number quickly increased during the first quarter of 2014 with the case of the Ligiw Family. On Saturday, the tragic murder of Romeo Capalla, member of Samahan ng Ex-detainees Laban sa Detensyon at Aresto (SELDA, Alliance of Ex-Detainees Against Detention and Arrests) and younger brother of Davao Archbishop Emeritus Antonio Capalla, became the 11th documented case of political killings this year. Jenabi Pareja of the New York Committee for Human Rights in the Philippines (NYCHRP) was critical of US involvement in HRVs overseas. “We aim to shed awareness on the murder of a fellow kasama (comrade), but also of our firm position to end all U.S. military aid to the Philippines,” said Pareja. Since 2002, the US has sent a total of $500M in military aid to the Philippines. In addition, Secretary of State John Kerry pledged another $40M for 2014 after visiting the Southeast Asian country post-Super Typhoon Haiyan in December 2013. The US and Philippine governments are also entering the seventh round of talks, intending to close a deal on the “Agreement on Enhanced Defense Cooperation” by next month. In a Twitter exchange with Anakbayan NY and NJ on Saturday, the Philippine Embassy in Washington, DC stated an ongoing investigation of the Ligiw case is being conducted. The Embassy also gave assurance that the “state will go after those behind these political killings”. “We [Anakbayan chapters overseas] are deeply disturbed and outraged by this brutal attack to a kasama. We will not stop until justice is served- for Freddie, for Jonas, for Sherlyn, for Rachelle, and all victims of political killings back home,” said Nina Macapinlac, member of AB-NJ.